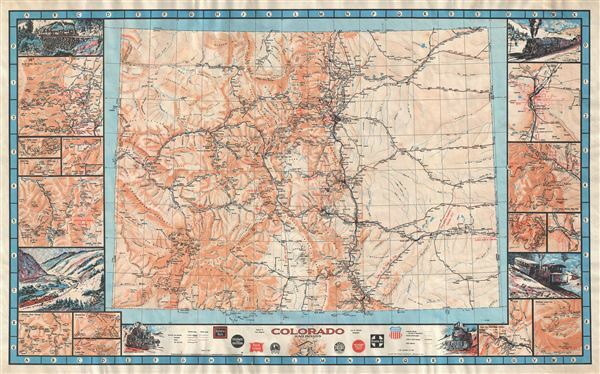 An attractive pictorial map of Colorado's many historic railways. This is a dramatic 1943 pictorial map of Colorado intended to glorify and illustrate that state's many historic railroads. The map was drawn by Linn H. Westcott for Train Magazine. The map covers the entire state with topography rendered via shading. Creeks and rivers are noted and colored in blue. As might be anticipated railway lines are represented throughout: the Burlington Route, the Colorado and Southern, the Rock Island, the Denver and Rio Grande, the Union Pacific, the Santa Fe Line, and the Western Pacific Lines, among others. Rail lines are broken down by the type of train Standard or Narrow Gage, as well as those currently operating vs those abandoned, as well as electric vs. rack and pinion. Red text on the map proper identifies rail passes, gorges, whether the routes are curvy or straight, and other information important to the railroad enthusiast. The map is surrounded by numerous smaller detail maps as well six illustrative vignettes. The map is accompanied by a large index sheet. A scarce map that rarely appears on the market. Linn Hanson Westcott (July 13, 1913 - September 8, 1980) was an American railroad enthusiast and model railroader, best known as the influential editor of Model Railroader magazine. Born in Los Angeles, California, Westcott attended Carleton College in Minnesota. Starting with publication of his contest-winning track plan in 1934, Westcott enjoyed 46 years of association with Model Railroader, serving 16 years as Editor (1961-1977), and following that as Editor Emeritus. Westcott made many innovative contributions to nearly every aspect of the hobby, and was creative and forward thinking in layout planning, modeling of equipment, scenery techniques, and electronics and control systems. He traveled widely in the US, making extensive documentation of prototype railroad structures, equipment, and practices. Westcott died in September of 1980 and was survived by his wife, Harriet, two sons, one daughter, and five grandchildren. Very good condition. Thick paper. Blank on verso. Backed on archival tissue.